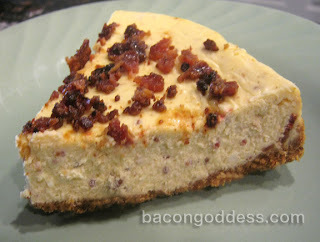 I posted something on a social networking site about enjoying a bacon cheesesteak and one of my friends commented: "For a second I saw 'bacon cheesecake'", which gave me an idea. After some searching I found out that yes, it HAS been done. I just wasn't that pleased with the recipes I saw. 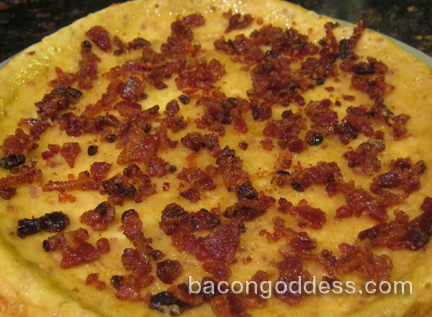 I want a simple cheesecake with the addition of bacon. So I made up my own recipe. This is for you, Scott. Dredge 4 additional strips of bacon through some brown sugar and bake some candied bacon as well. 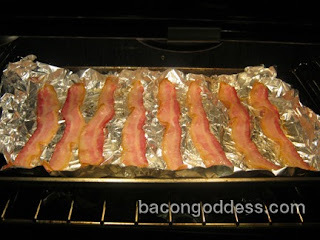 Turn the oven down to 350 and set the bacon aside to cool. SAVE THAT GREASE! Make the crust while it cools, then crumble 2 strips of the plain bacon very finely (I used a food processor) and 4 strips finely and keep separate. Eat the extras, if you haven't already. Crumble the candied bacon coarsely and keep separate. Blend your graham cracker crumbs and sugar well. Soften your butter until it's almost melted (and/or bacon grease) and slowly pour into your dry mix, stirring to blend. Add the 2 strip pile of very finely crumbled bacon and pull out any chunks that are too chunky. When it is completely mixed and sticks together well, start pressing the mixture into the bottom of your pan and up the sides a bit. You can get it smooth and even using the bottom of a drinking glass or similar. Bake at 350 for 8 - 10 minutes, but keep an eye on it - you don't want to burn it or bake it too much or the crust will be hard and gross. You're shooting for nice and browned. Take it out and let it cool completely, then grease the sides of the pan well above the crust. Beat the softened cream cheese until it is creamy. Add the sugar and vanilla and beat creamy. Add the 4 strip pile of bacon and beat creamy. Now comes the tricky part. 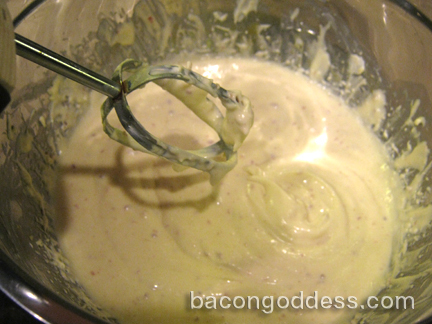 Add the eggs one at a time, slowly, and just beat well enough to blend - do NOT beat the hell out of it once you add the eggs or it will force too much air into the batter and it will fall when you take it out of the oven. Scrape the sides as you blend to make sure you've gotten those eggs mixed in really well. 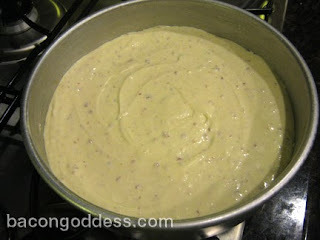 Pour your batter into the greased pan on top of the baked/cooled crust and put it in the oven for 35 minutes. Place a pie dish filled about 2/3 full of water on the bottom rack while you bake your cheesecake. This helps keep the oven steamy and your cheesecake creamy! You can also do a water bath if you're familiar with it, but they scare me so I don't do those. When the timer goes off take out your cheesecake and run a very thin bladed knife carefully around the inside of the pan so it can pull away from the pan properly. Put it back in the oven, turn off the oven and crack the door. Let your cheesecake stay in the oven as it cools to finish the baking and prevent cracking. About 40 minutes is usually good. 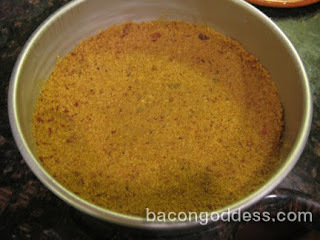 Take it out and sprinkle the candied bacon crumbled evenly across the top. You can remove the springform sides now, or let it chill in the fridge overnight before removing the pan. Regardless, let it chill at least three hours before you eat it. NOTE: Cheesecake is evidently pretty tricky. This is something you'll have to experiment with and learn what works best for you. Everyone has their own way of doing cheesecake. 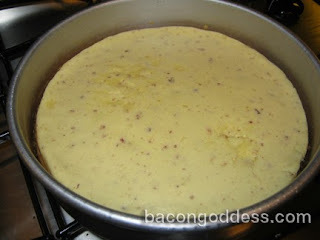 I beat the hell out of my batter the first time after I added the eggs and my poor bacon cheesecake fell when I took it out of the oven. It was still creamy and delicious, though. I mean, we all strive for the perfect cheesecake, but are you really NOT going to eat one that's not absolutely perfect? Will take a BITE out of this too - thanks! Can this be made without sugar so someone with diabetes can enjoy it? Yummy cheese cake... this one best suits for birthday cakes, any occasion cakes. Can't wait to taste it. Oh Google, what have you done? Recipe search? Makin’ Bacon at Home Day! Bacon Baby Formula. Wait. What?